Who else wants one of the most advanced betting tools on the market? Learn how this set and forget easy to use automated betting software can help you. 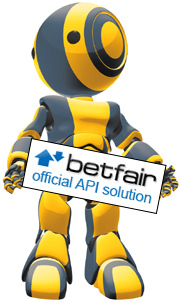 Unfortunately on betfair today you are up against betting bots just like GHB, so instead of fighting the crowd why not get into the action and let this software do the hard work for you. Whether it is Horses, Greyhounds or Football. Straight backing, laying or trading the GHB can handle it easily. Thank you so much for the grey horse bot. I think it's 19 days that I've been using it, and in that time I've doubled my £100 starting bank. brilliant! I've found it to be very consistent and as you say, it usually wins in the first few races of the day. I've been very restrained in it's use and I'm trying to keep to your guidelines as much as possible. I've set the profit low and waited for the bot to win and stop, then re-started it a couple of times to do the same. But only if there are still a lot of races still to go! I'll definitely be a continuous subscriber to this one. I often get the question. "What is a bot?" Well a bot (short for robot) is a software program that can automatically bet for you using the criteria that you give it to follow. The real beauty is that the GHBot does it automatically for you, it takes less than 5 minutes to set it up and then it automatically places bets based on the criteria that you give it, you can even use the ones we give you in the GHBot settings Manual (or from the bonus area). It's even safe... you can set your maximum acceptable loss on the odd occasions things do not go your way. The Bot is fantastic, thank you. I have steadily been making £10 a day (£2 stakes) and am thrilled to bits. I set it up in the morning before work and return home to find a message that my profit has been met and the Bot has turned itself off. The Grey Horse Bot also has to betting modes. Automatic and Manual. Automatic allows you to bet on selections based purely on a number of factors. Odds Range: from 1.00 to 100 or anything in between. Number of Runners: Runners in the race. Place: 2, 3 or 4 in any combination. TTS(Start): Time before off to start betting. TTS(Stop): Time before off to stop betting. Go in play: Keep on betting up to the end of the race. All the above options can be combined to create your perfect betting criteria. Any one who tells you that you can not lose when you bet is seriousley giving you bad advice. Lossing is just as much a part of betting as winning, but the trick is to win more than you lose, that's how you make money. But to make sure you are as safe as possible when using the Grey Horse bot, we have added 4 main ways to stop the bot. Stop Profit: You can stop the Grey Horse bot if it reaches your profit target. Stop Loss: You can stop the Grey Horse bot if it reaches your maximum loss target. Win Streak: You can stop the Grey Horse bot if it wins "x" amount of races. Lose Streak: You can stop the Grey Horse bot if it loses "x" amount of races. New options added all the time! Again all the above options can be combined for you to find the best settings that suit you. These are only a few of the options available. So wouldn't you rather a low risk strategy that you can use every day automatically to boost your bank balance, pay of a debt or save for a really good holiday, or are you going to believe the hype and buy another system that promises £1000's? We recently started a survey* and here are some interesting facts. Were the instructions clear? 91.67% said YES. Although we would have liked 100% on everything we think you will agree that this is a pretty good score. Do you want to know how much it is going to cost? Well rather than sell you the bot for several £100's, which the GHBot is easily worth, I have decided to rent it to users instead. That means you do not have to make a big initial out lay, and even it you don't like it after using it for a while, you haven't lost a fortune. If you decide to carry on using the bot after the first 30 days, you will then be charged £27 and £27 every 30 days for as long as you subscribe. It goes without saying that during your membership you will be entitled to any updates to the Grey Horse Bot or manual and you will receive regular updates. 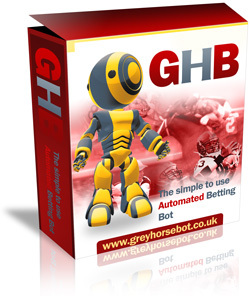 Now that the Grey Horse bot works with football, you can use it to automatically bet on in-play matches and use many of the football systems that are available...but now you can let the bot do it automatically!! So now is the time to forget the hype and save yourself lots of time by subscribing to The Grey Horse Bot Service.